I think every kid growing up in the 80’s and 90’s learnt a lot from our dear old friend Leisure Suit Larry. Well now a whole new range of kids are about to be exposed to Larry’s adventures through the eyes of his nephew, Larryâ€¦ I guess they wanted to keep the name going. 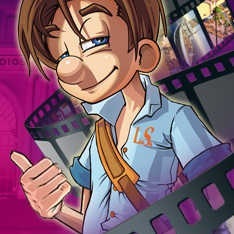 Leisure Suit Larry: Box Office Bust has Larry wandering a movie studio doing odd jobs, spying on his competitors and getting himself into all sorts of sexual nonsense. Leisure Suit Larry was always a humorous and relatively clean mature game so I am hoping that they continue with that theme and get this one right. Larry was initially dropped during the Activision Blizzard merger last year but has now been picked up by Codemasters and should now be published as early as April this year. Larry is coming to a PS3, Xbox 360 and PC near you. Next article Oh My! Metal Gear Solid Touch.